Ladies: a question for you. When you think of a catch up with ‘the girls’ what comes to mind? Let me guess – lots of chatting, laughter, and a good cup of coffee. Spending time with your closest friends is the ultimate way to boost your mood, share support and spread inspiration to be your best self. But maybe it’s time to swap the cafe for the climbing wall? Climbing with friends is one of the best activities you can do to strengthen your sisterhood – and feel great in the process! This is why we created Ladies’ Night at Rock and Rapid Adventures. 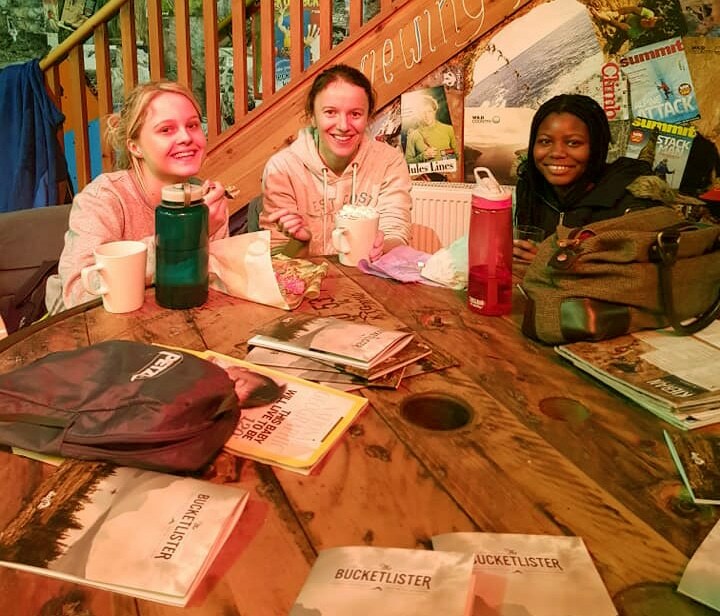 Every Monday from 7:30 p.m., we welcome women to come along and climb with their friends – or to meet new people over a friendly belay – and enjoy a free hot drink in between routes! 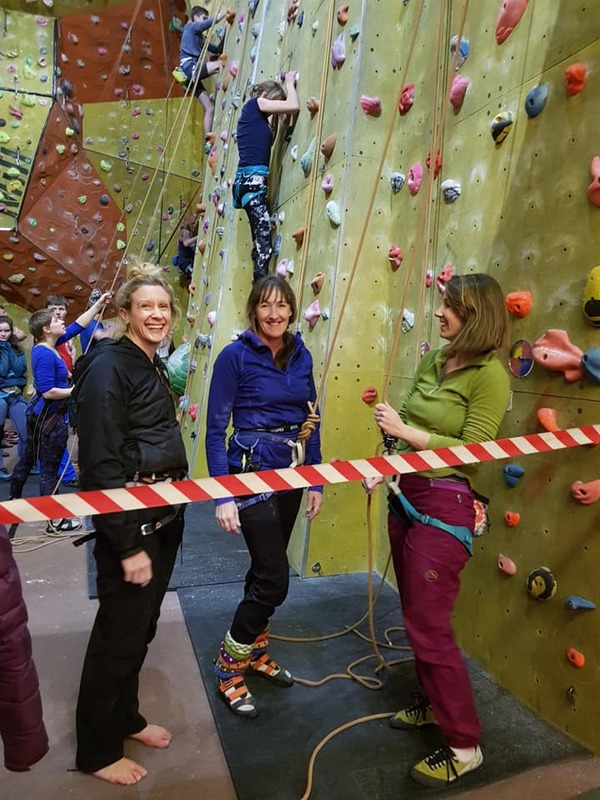 With specialised group skills workshops based around the group’s aims, plus tailored climbing-orientated workouts and, of course, plenty of fun, Ladies’ Night is a truly empowering way to spend a bit of quality girls’ time. Most of us have close friends from various different walks of life – whether they be work friends, university friends or old friends from school. Naturally, as life takes us on its unpredictable journey, you might develop different interests and hobbies from your friends. Discovering a new exciting activity like rock climbing can be a great way to bring your girl-friends together with something to share, regardless of what else you have in common. Having a particular activity that you do with your female friends is a great way to make sure you all catch up regularly – especially if you join in an event like Ladies’ Night. As climbing is such an engaging sport, it’s the perfect activity for adding a bit of fun to your weekly schedule. No longer will you dread Mondays, because Monday means Ladies’ Night! When you talk to women climbers, you will often find that discovering rock climbing helped them enormously in building their confidence – both physically and mentally. Many female climbers report that climbing has helped them feel stronger inside and out, as well as reducing anxiety and stress. When you’re climbing, the only thing you’re thinking about is getting yourself to the top of the climb – and this is brilliant for clearing your mind of worries and improving focus. Each time you go climbing, you’ll have new achievements under your belt (well, harness! ), boosting your confidence with every route. Climbing is a unique sport in that it can be both very personal and incredibly social – depending on your own preferences. There is no pressure to perform to a certain level when you climb because it’s an individual sport – it’s all about your own goals and progress. This means that you can push yourself as much as you want to each session with no expectation from your fellow climbers. However, equally, climbers are the naturally encouraging type, so if you need a bit of cheering on – or even a spot of beta (advice), the Ladies’ Night at Rock and Rapid is the perfect place to find it. One of the best things about climbing with other women is that you can tailor your training to your personal challenges and goals. Whilst pro female climbers like Margo Jain have shown the world that (even the most petite) women can climb just as hard as men, many female climbers can find they have different strengths to their male counterparts. Many women find that, rather than relying on upper-body power to get through tough moves, they can use their strengths in flexibility, balance or footwork. Of course, this isn’t a fixed rule – and if you want to get pumped in the bouldering wall, you’ll always have the full support of your friends to cheer you on! We run specialised skills sessions based on what our ladies want to focus on. This means we can all work together and share tips on how to improve particular areas of our climbing. These sessions are run by one of our professional instructors, so you’ll get pro tips on everything from slab climbing techniques to increasing your bouldering grade. Here at Rock and Rapid Adventures, we’re all about empowering people through climbing – and we want to share the amazing effects of climbing with all of the amazing women we meet! Climbing is a great vessel for female empowerment because it bolsters a sense of independence, capability and freedom. On Ladies’ Night, we celebrate our awesome women climbers and create a community of mutual support and empowerment around climbing. Whether it be discussing elements of climbing that members have been struggling with, issues unique to climbing as a woman, or simply shouting beta up the wall, it’s all about lifting each other up and feeling unstoppable together! Many of us want to keep fit – it’s an important part of our physical and mental health. However, not all of us love going to the gym. Luckily, climbing is a fantastic full-body workout that swaps the treadmills for a decidedly more enjoyable activity. Climbing is fantastic for enhancing your upper-body and core strength, flexibility and stamina. After just a few months of climbing, you’ll notice huge improvements in your strength and fitness. Better yet, no two climbing sessions are the same, so you’ll never get bored of trying out new routes – and with a group of lovely ladies to climb with, every session will be so full of laughter and fun that you’ll barely notice the brilliant workout you’re getting! 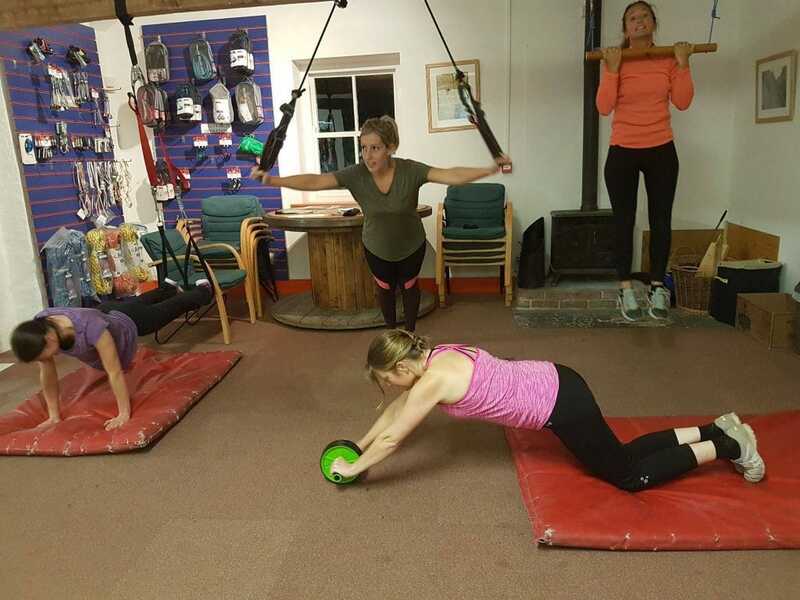 As well as our skills sessions, we also often include specialised workouts and warm-ups to complement our ladies’ aims – whether it be group yoga stretching for flexibility or exercises to boost core strength. If you like the sound of climbing, but your current group of friends aren’t keen, don’t worry – Ladies’ Night welcomes you with open arms! In fact, many of our ladies started off as solo climbers and came to Ladies’ Night to find supportive climbing partners. There’s always someone ready to belay or project a route with you, and in the process, we promise that you’ll make loads of new friends for life. We’re also planning to introduce more outdoor group climbing as part of ladies’ night, so if you’re curious about getting out on some real rock, joining Ladies’ Night is the place to start! So what are you waiting for? Rally up your ride-or-die ladies – or head down as an independent woman – and join us for Ladies’ Night at Rock and Rapid Adventures this Monday evening at 7:30 p.m! If you want to try climbing out first, you can book in for a taster session with one of our supportive instructors first. To find out more, just contact us today on 01769 309002.